Yishai (left) and Deri (right) reconcile. 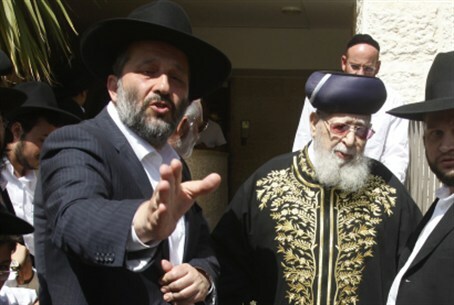 Rabbi Refael Pinchasi of Shas, a former MK and current Secretary of the Torah Sages Council, is angry with former party chairman Aryeh Deri for saying that he is the party's current leader. The party does not have a formal leader at this point, and is ruled by a triumvirate composed of Minister Eli Yishai, who headed the party until recently, former chairman Aryeh Deri, and Minister Ariel Atias. Deri aroused Pinchasi's ire by claiming that he is, in fact, Shas's leader. Speaking on Channel 1 television, Deri said: "I run Shas today. We have a joint leadership but every board must have a chairman, and I am the chairman of the board at this time. Everything to do with running Shas is me. Of course, I have friends and I consult with them and cooperate with them." However, IDF Radio published a recording Monday in which Pinchasi called Deri's claim "one big bluff." "Deri has limited authority only," Pinchasi insisted. "And he is waging unnecessary battles against Eli Yishai – only because he did not win the first place on the list." Pinchasi explained that Deri was given signatory powers as representative of the party's Knesset list, because he is running the election campaign, but that the signatory powers for representing the party are still in Yishai's hands.